Summer 2015 brought warmer temperatures and our seasonal fundraising and community events. 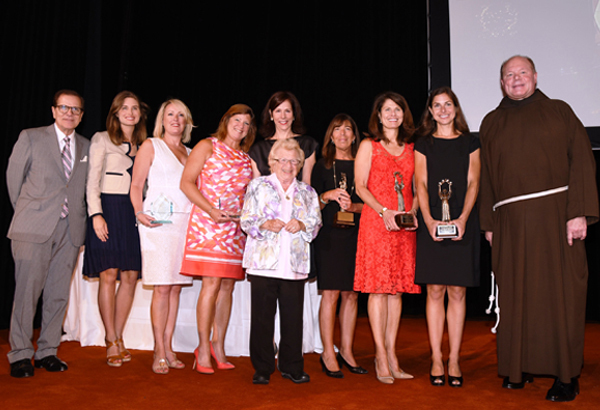 On Thursday, July 30, 2015, St. Francis Food Pantries and Shelters our Thirteenth Annual “Women of Valor” Awards Tea took place at the Waldorf-Astoria. The luncheon event, spotlighted a distinguished group of women who are leaders in business and when it comes to giving back to provide support to their communities. Honorary Chair and Keynote Speaker Dr. Ruth Westheimer and Macy’s Community Star Award Recipient Lauren Bush Lauren (Founder & CEO, FEED Projects) were on hand for the special afternoon to honoring Linda Neely (Director Business Development, Knoll) among others! Sadis & Goldberg became the latest company to participate in a "CAN-opoly" project with Impact 4 Good. The team-building exercise called for over 30 employees to work together and use cans of food to build NYC landmarks. 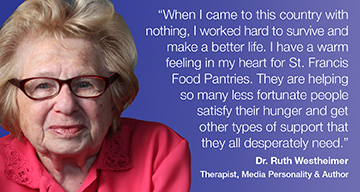 By the end, 63 cases of canned goods were given to us and later sent to a food pantry we help in Brooklyn, NY. Once again, our friends Con Edison followed a new, fun tradition of donating New York Yankees tickets so that some underprivileged kids could enjoy ball games this summer. Our ever-popular “Peanut Butter and Jelly Sandwich Making Day” Program has continued to be a great way for companies to engage employees with a noble mission to give back to others. Volunteers from Ted Moudis Associates, JP Morgan Chase, Morgan Stanley and Wells Fargo recently made thousands of PB&Js that were distributed to various food pantry locations we support. We were able to ensure HOPE Community Services has a fun and festive holiday by sponsoring a 4th of July BBQ! It was a pleasure to be able to cover the cost of tuition for several children who participated in CYT NYC’s newest production: Willy Wonka Jr.! This was definitely a standing ovation-worthy performance!